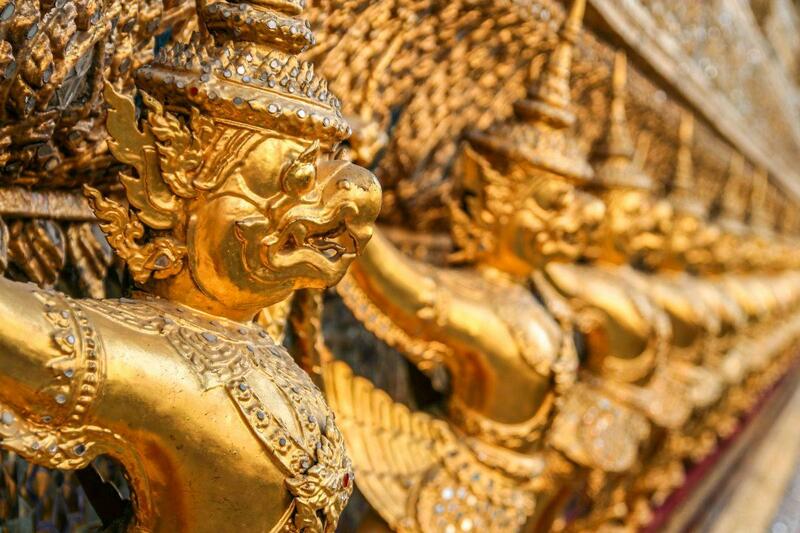 The Grand Palace in Bangkok is Thailand’s most sacred site and spiritual heart of the Thai Kingdom. It’s also the most visited tourist attraction in Bangkok. 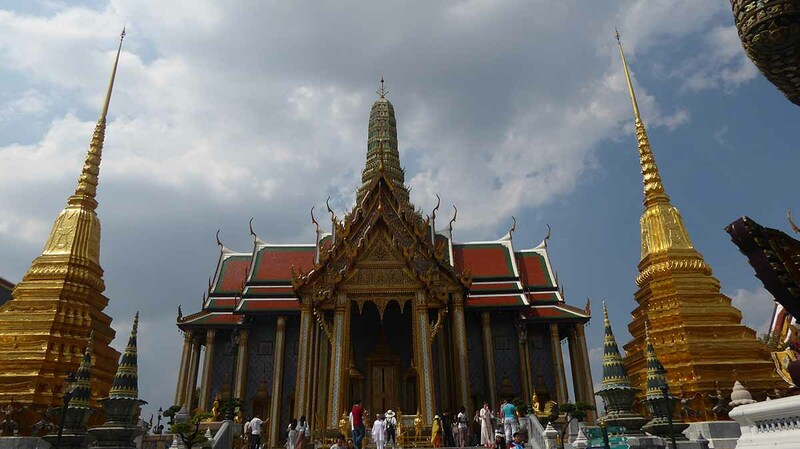 Inside the palace grounds is Wat Phra Kaew also known as the Temple of the Emerald Buddha. The palace and temple are in the Rattanakosin old city of Bangkok. 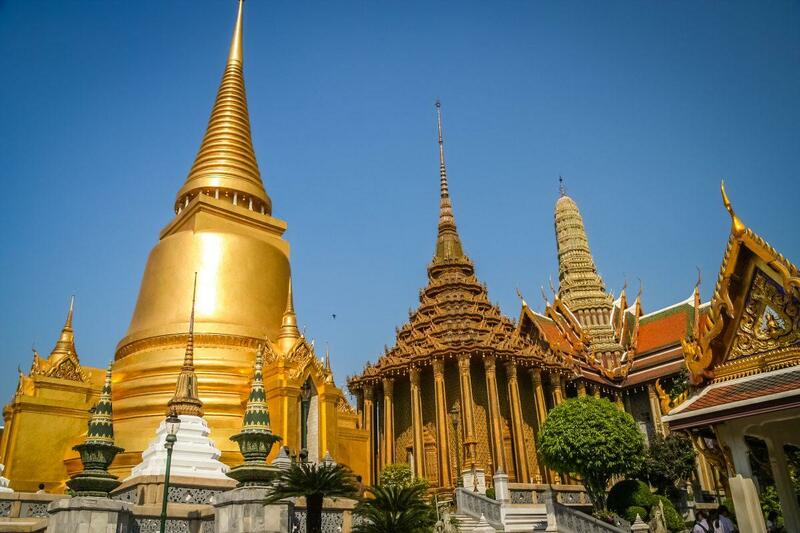 The Grand Palace was built in 1782 by King Rama I upon the establishment of the city of Bangkok. It opened in 1785 and was the official residence of the king until 1925. It is now only used for ceremonial purposes though some royal offices are still in use. Not all the buildings are open to the public. The middle court features the very French-styled Phra Thinang Boromphiman, built in 1897 by King Rama V for his son Rama VI who lived there from 1910 till 1925. 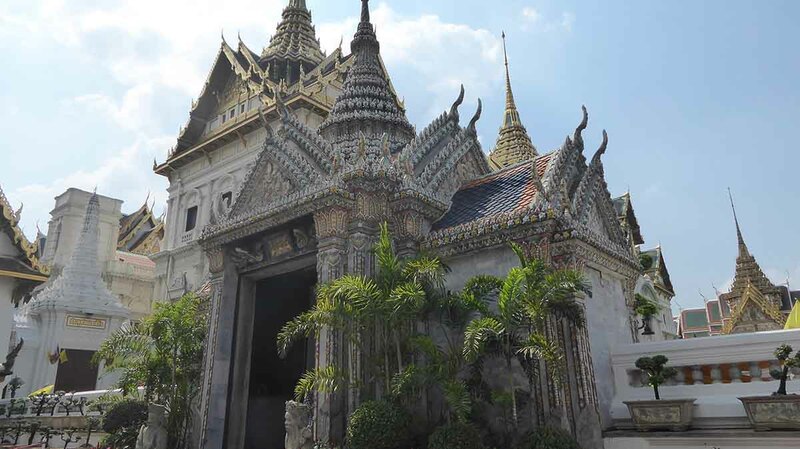 This building is never open to the public and only viewed through a gate just as you enter the middle court from the Temple of the Emerald Buddha. 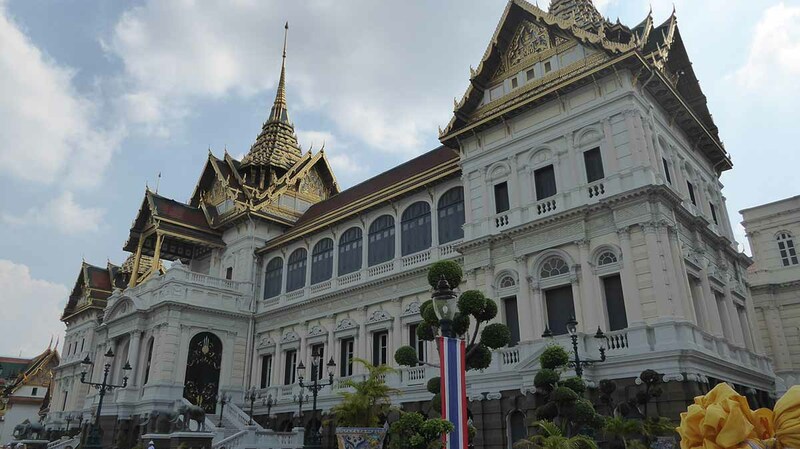 Next to Phra Thinang Boromphiman and open to the public on weekdays is the Amarin Winitchai Throne Hall, constructed as a royal audience chamber for receiving foreign ambassadors and is now used officially for coronations and contains two royal thrones. 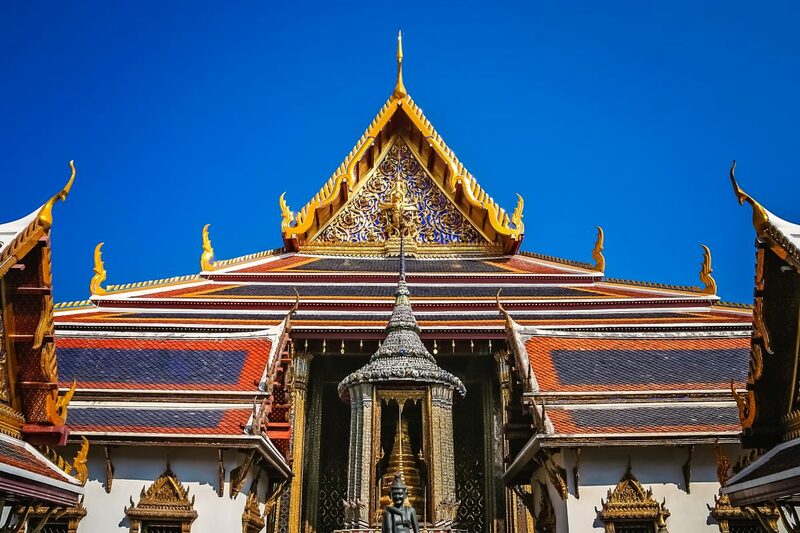 The Grand Palace isn’t a single structure but is a complex of impressive buildings, halls, and pavilions set around courtyards, gardens, and lawns. The complex divided into an Inner, Middle and Outer Court. Originally, not only the royal court but the entire government based here including state departments, the war ministry, the treasury, and the royal mint. There are different styles of architecture inside the complex and extended over time. The original buildings were of classic Ayutthaya design while later additions during the reign of King Rama V had more western influence. 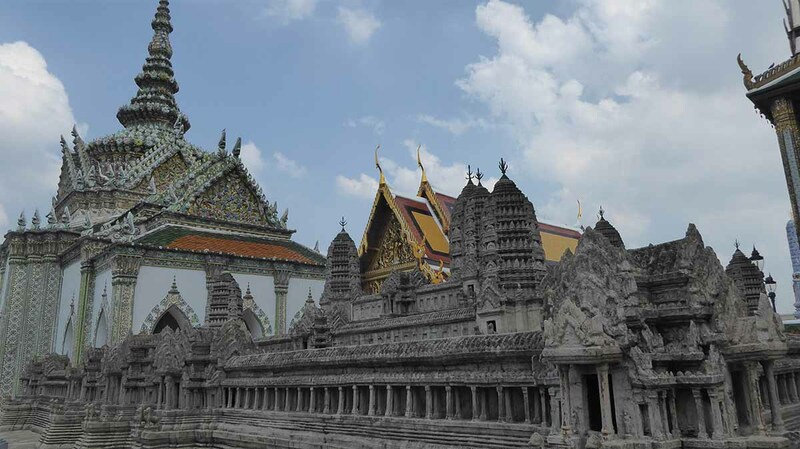 The Temple of the Emerald Buddha is just outside the walled Grand Palace in what is known as the outer court and was the King’s private palace temple. The biggest building is the centrally located Chakri Mara Prasat, built by British architects as a royal residence for King Rama IV. 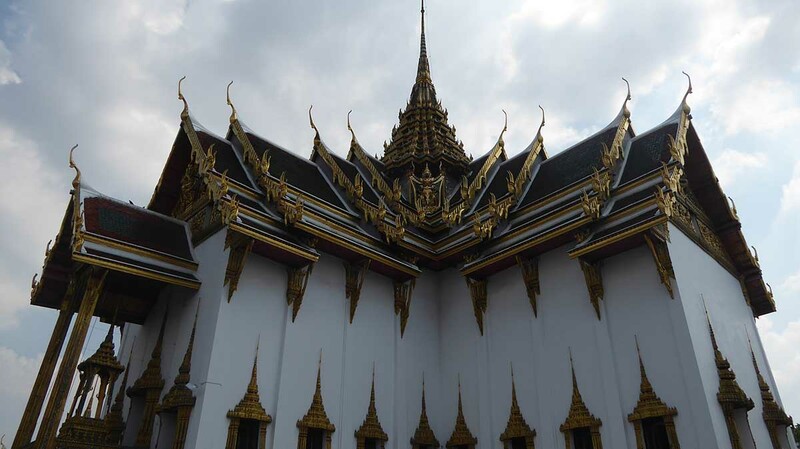 The impressive European style building features a Thai temple style roof. The main part of the building is not open to the public and hosts important state functions. The basement of the building houses a weapons museum which is open to the public featuring a collection of spears, swords, and guns. To the side of the Chakri Maha Prasat, you will find the entrance gate to the Inner court which is where the King’s consorts and daughters lived. Only women and boys under the age of puberty could live there. The outer court which was entirely populated by men. The Inner court guarded by combat-trained female sentries. The Inner court is not open to the public, though an exhibition on life inside the inner court is at the excellent Rattanakosin Exhibition Hall. 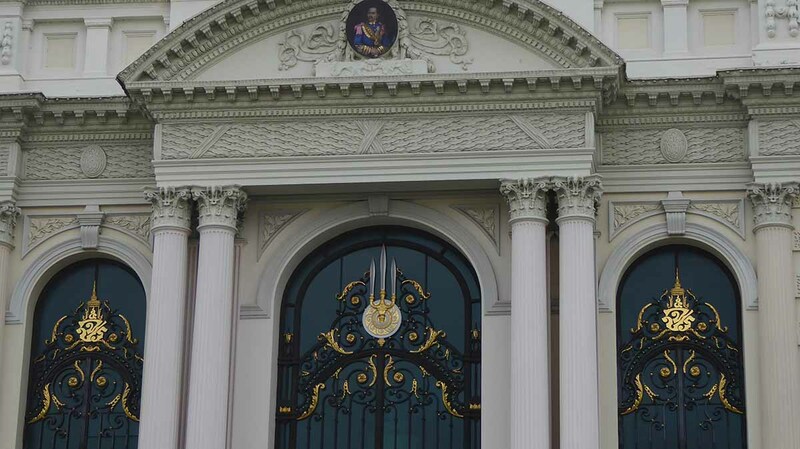 The next building is the Dusit Maha Prasat Throne Hall, an audience hall built by Rama I which is now only used for royal funerals, hosting lying in state ceremonies. A mother of pearl inlaid throne is inside. 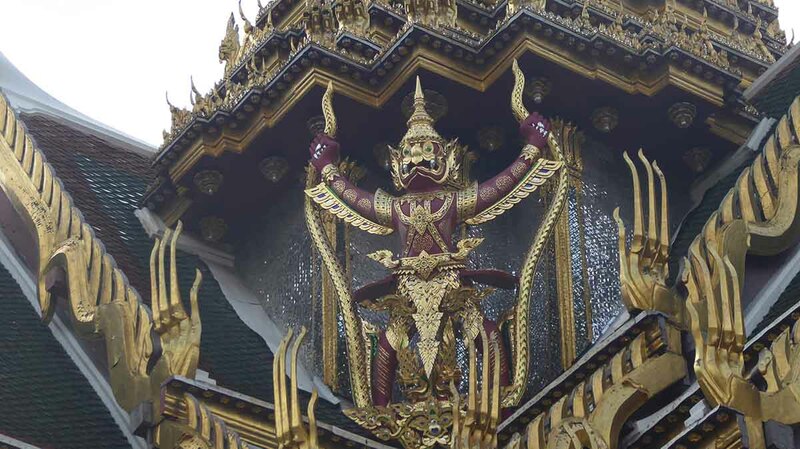 The four corners of the roof each feature a garuda. The hall is open to the public. There is also a small cafe near the Dusit Maha Prasat where you can buy drinks, snacks, and Ice Creams. The Temple of the Emerald Buddha History Museum is opposite Dusit Maha Prasat and explains the history of the sacred image and contains the robes that used to clothe the Buddha that is now not in use. Wat Phra Kaew known as the Temple of the Emerald Buddha is the most beautiful, important and sacred Buddhist temple in Thailand. The temple, built in 1784 as the King’s private palace temple was used for royal religious ceremonies. Unlike other temples it has no resident monks. It is in the outer court of the palace complex. 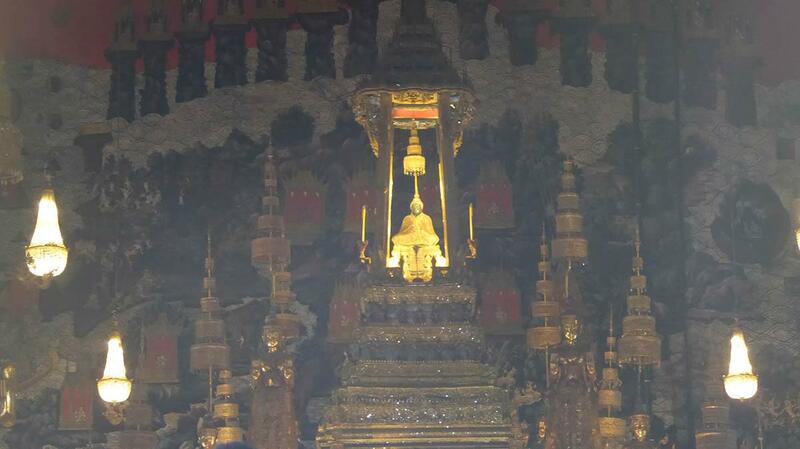 The most famous feature of Wat Phra Kaew is the statue of the Emerald Buddha in the main chapel. The Emerald Buddha (Phra Kaeo Morakot) dates from the 15th century and brought to Bangkok in 1782 by King Rama I, though it’s origin is unclear. 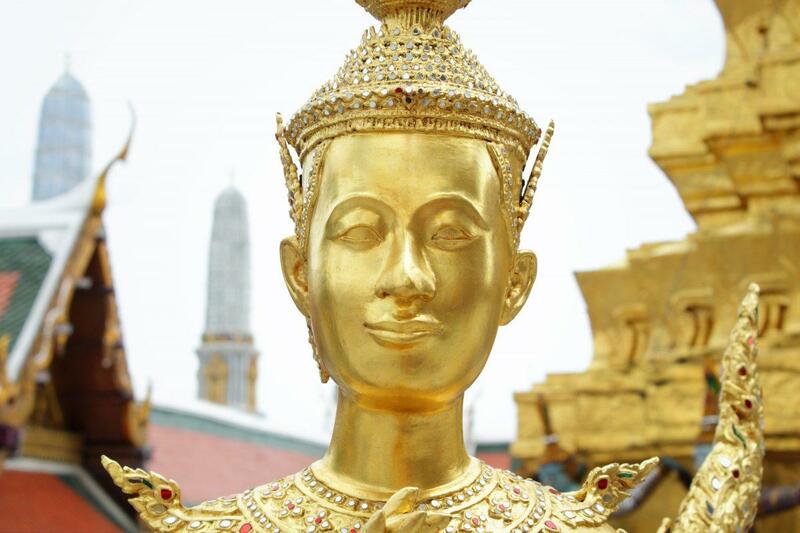 According to legend, the Emerald Buddha brings prosperity to the country in which it resides. Thai people believe it is sacred and protects the country. The Buddha was carved from a single block of fine jade. Emerald refers to the dark green color. Only the Thai king and his son the Crown Prince can touch the Emerald Buddha. The King changes the robes of the Emerald Buddha three times a year in a special ceremony. The robes are gold and the changing of them mark the changing of the season. This is an important ritual that brings good fortune to the country. 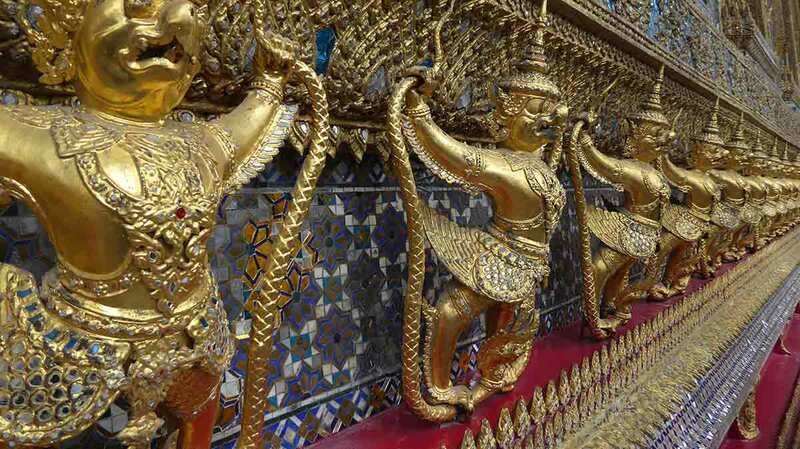 The two out of season cloaks are in the temple museum in the Grand Palace middle court. Thai people pay homage to the Emerald Buddha with incense sticks, candles and a pair of lotuses for prosperity throughout the year. The interior wall of the chapel, decorated with late Ayutthaya-style murals, depict various stages of the Buddha’s life. The murals run anti-clockwise. You cannot take photo’s inside the Temple of the Emerald Buddha. Wat Phra Kaew is within a covered cloister, the outer wall, decorated with the entire 178 scenes of the Thai national epic story, the Ramakian, based on the Indian epic Ramayana. 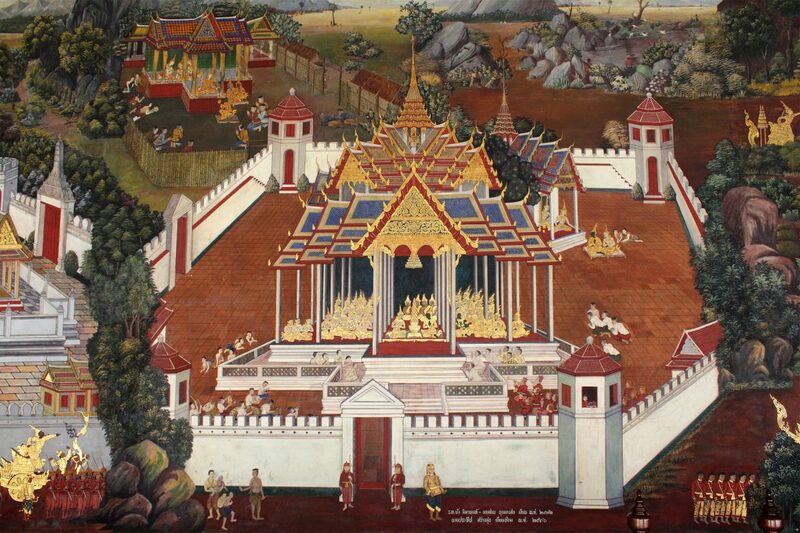 The Ramakian was written and painted during the reign of King Rama I (1782-1809). The murals start at the north gate following in a clockwise direction covering the entire compound wall. The murals serve to emphasize the human values of faith, honesty, and devotion. The pillars of the cloister feature inscriptions that describe the scenes. 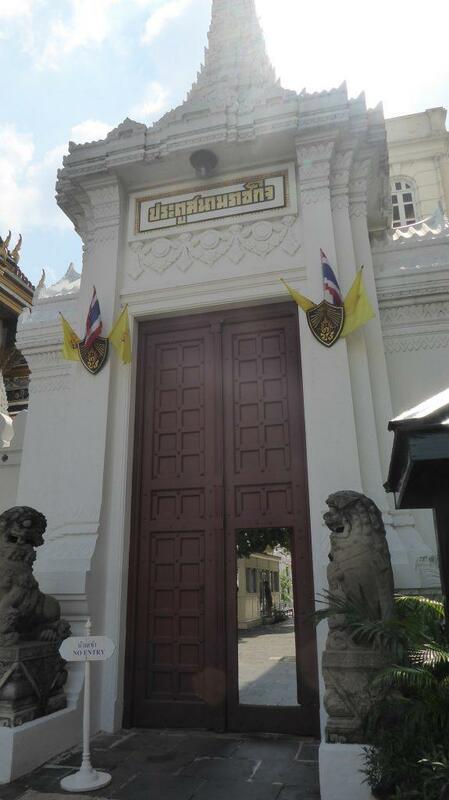 Each entrance to the compound guarded by a pair of huge Yaksha demons (gate-keeping giants) who are characters that appear in the Ramakian. Around Wat Phra Kaew are other important monuments. To the north of the main chapel are three pagodas representing the changing centers of Buddhist influence. 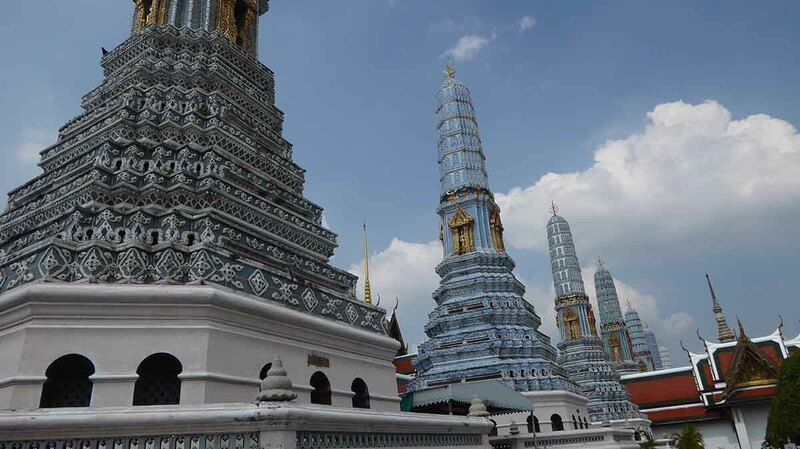 On the western side is Phra Si Ratana Chedi, a 19th-century Sri Lankan-style stupa housing ashes of the Buddha. In the middle, Phra Mondop, a library built-in Thai style by Rama I, with Ayutthaya-style mother-of-pearl doors, bookcases containing sacred Buddhist manuscripts, and statues of Chakri kings. On the eastern side of Wat Phra Kaew is the Khmer style Royal Pantheon. The Royal Pantheon is open to the public for one day every year on Chakri Day in October and celebrates the founding of the Chakri dynasty. To the north of the library is a model of the Cambodian temple Angkor Wat. In 1860 Siam sent an army to Cambodia to dismantle the temple and bring it back to Bangkok but the attempt failed so they made a model instead. 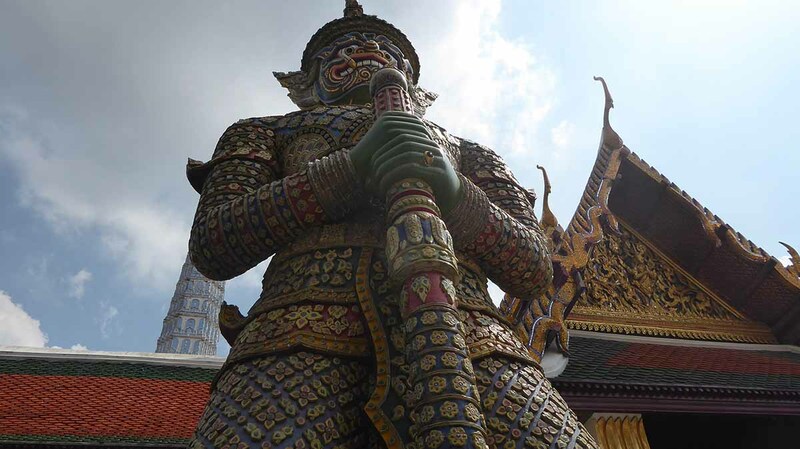 Along the eastern edge of Wat Phra Kaew are eight tall prangs built during the reign of Rama I. They represent the eight elements of Buddhism. A bronze image of a hermit who invented yoga and has healing powers is in a sala near the entry gate. Relatives of sick people come here to pay respect and make offerings of incense sticks, fruit, flowers, and candles. 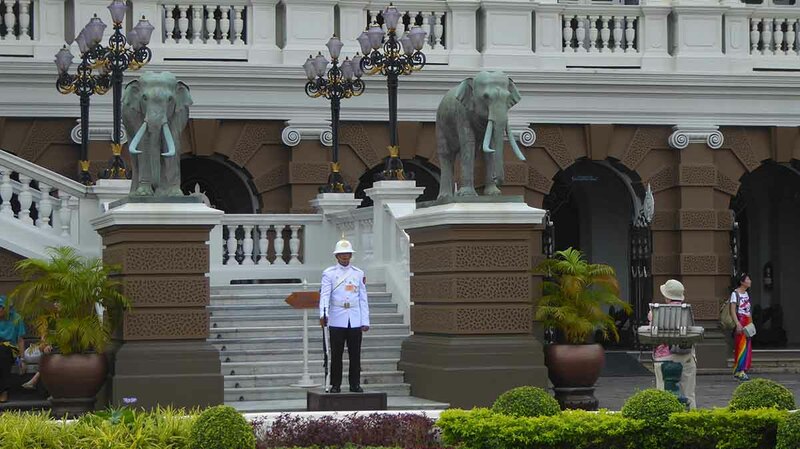 Also around the compound, you will see statues of elephants thought of as symbols of independence and power. Parents believe that if their children walk around the elephant three times it will give them strength. After which they rub the elephant’s head is for good luck. 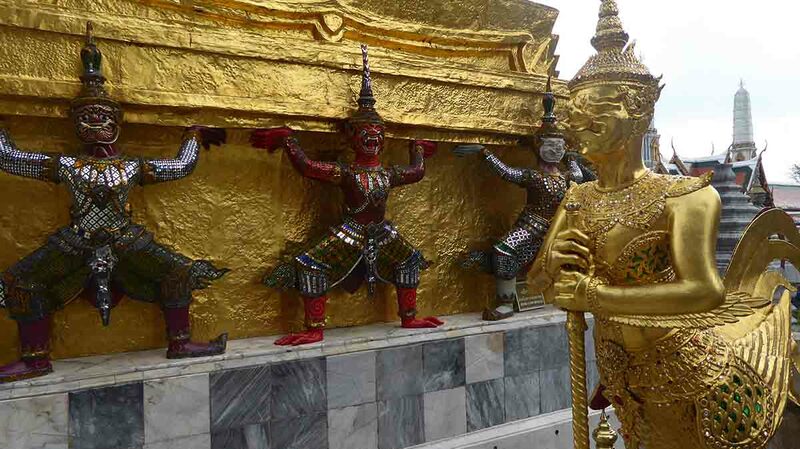 How should you dress to visit the Grand Palace? 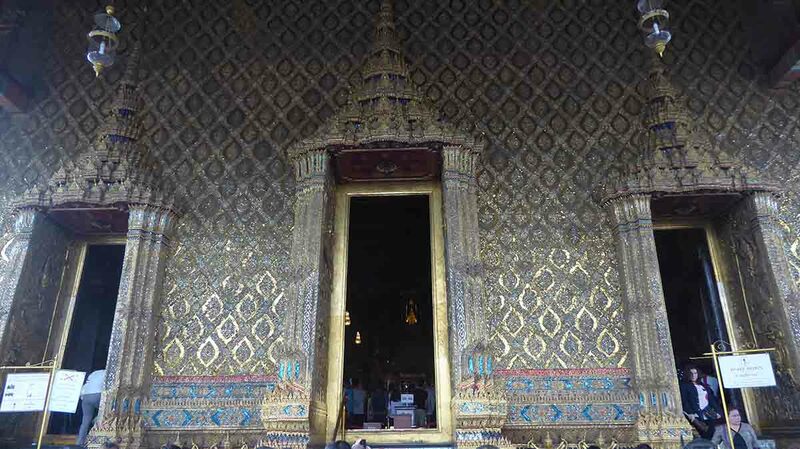 If you are visiting The Grand Palace & the Temple of the Emerald Buddha take note that a very strict dress code applies. The following are not allowed. 6. Sweatshirts and sweatpants, wind-cheaters, pajamas and fisherman trousers. Appropriate clothing hire costs 500 baht. On your way to the palace, you often find Tuk Tuk drivers or touts who will tell you that you lack proper dress and can’t go in. They will tell you they can take you somewhere else to see a big Buddha. This is a scam to take you on a gem shop tour. Just walk on. 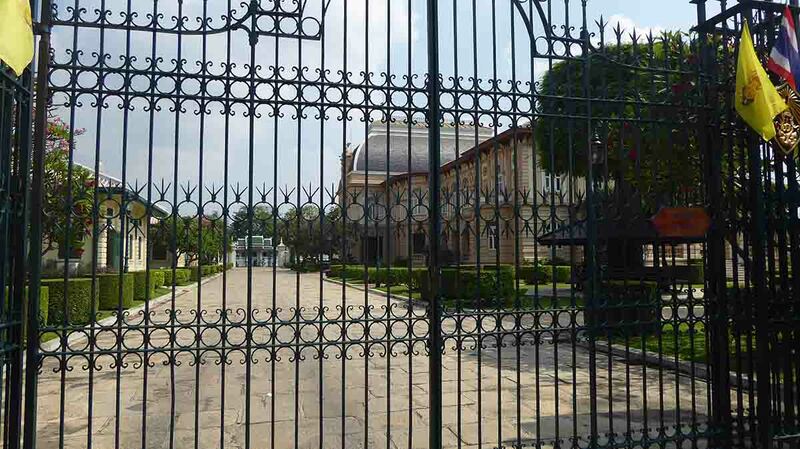 Take note of the above dress code or pay the 500 baht hire fee at the palace. It’s amazing how many people turn up at the palace dressed in hot pants and a bikini! 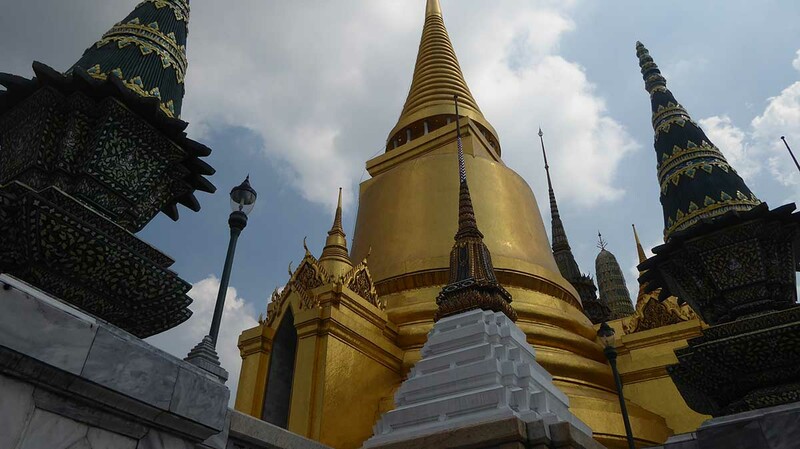 What is the best time to visit the Grand Palace? The best time to visit is early in the morning to avoid the crowds. The Grand Palace is very popular and the main entrance area is very congested at peak times with large groups of Chinese tourists following guides with flags, but don’t let this put you off as once inside it’s not so bad. When is the Grand Palace open? The Grand Palace is open every day. The ticket office closes at 15.30 sharp so don’t go late in the day. Personal audio guides in English, French, German, Spanish, Russian, Japanese or Mandarin are available for 100 baht at the ticket office. You also receive a free map of the complex. Free guided tours in English are available at 10:00, 10:30, 13:30 and 14:00. Tickets are 500 baht. Watch out for tuk-tuk/taxi drivers, fake guides (with official looking ID), friendly locals and touts near the main entrance. The objective is to persuade you to take free or 50 baht tours. You will end up at dodgy gem or tailors shop. They usually hang out just outside or on the traffic Island next to the pigeon fountain almost directly across from the main entrance. Rules: No shorts, short skirts or sleeveless tops. No open shoes.